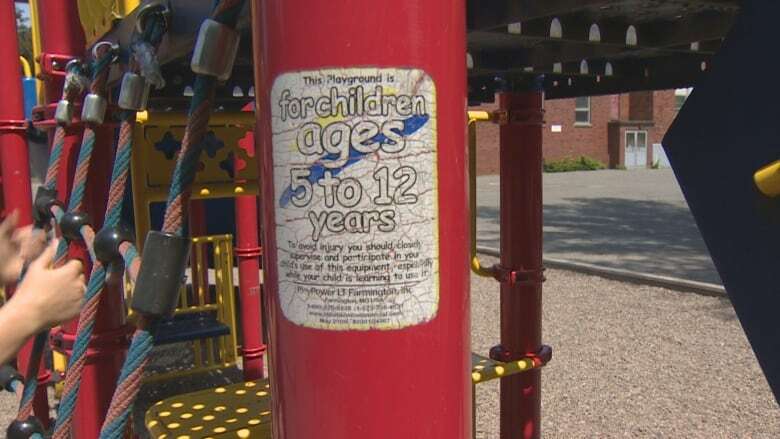 Children under the age of five are no longer allowed to use the playground equipment at Halifax schools, the Halifax Regional Centre for Education said this week. Hundreds of pre-primary school children in Halifax won't be able to use the playground equipment at schools this fall, the Halifax Regional Centre for Education said this week. "This issue came to light late last fall following the introduction of the provincial pre-primary program," said Doug Hadley, spokesperson for the HRCE, formerly the Halifax school board. Schools are covered by the Nova Scotia School Insurance Program. "The advice from SIP was that children under five should not be using playground equipment if it is not CSA-approved for that age group." That means the 560 pre-primary students registered for September won't be able to use any playground equipment marked for five and older. That covers most playground equipment. It also means four-year-olds in primary must wait for their fifth birthday to use the slides and climbing areas. "We've told our schools they should take steps to ensure there are no children under the age of five playing on playground equipment until they are of age," Hadley said. Hadley said in cases where parents bring their pre-school kids to school playgrounds, the parents would be responsible for following safety rules. "If they were not 'our' children, that would be a decision [parents] would make, much like they would make any decision in life with regards to regulations that are in place," Hadley said. They're talking with Halifax Regional Municipality about adding signage alerting parents that the equipment is meant for plus-fives only. HRCE doesn't build playgrounds, but has responsibility for students playing on ones located on school grounds. Hadley said future playgrounds could be built with younger kids in mind, but he noted that nearly all elementary school children are five or older. Hugh Lownds of Norwood Recreation, a private company providing summer activities for kids five to 12, had a group playing on the equipment at Oxford Elementary School Thursday. He is aware of the age restrictions. "I've mentioned it to a couple of preschool groups that it actually says for five and up. I wasn't telling them to leave, but I was informing them … if you have insurance and they're not supposed to be on it, you won't be covered," he said. He's run the business for decades and said playground equipment that gets kids climbing to high spots and swinging on bars are a "dying breed." "I think eventually they will be pretty tame and more of a fitness element will be put into it," he said.